Now available as an e-book as well as paperback, you can read the introductory material of Ride a Horse Not an Elevator by clicking on the "LOOK INSIDE" feature on Amazon. 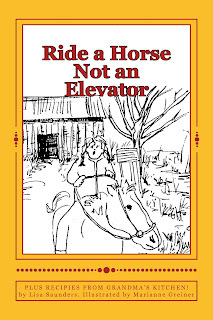 My children's novel, Ride a Horse Not an Elevator, is used by Cornell University in their "Horse Book in a Bucket" 4-H program (see how 4-H members can present the educational "no preparation required" program on page 6 of the following newsletter: http://www.ansci.cornell.edu/4H/horses/ubt/ubt_summer12.pdf). 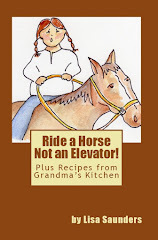 I have just revised Ride a Horse Not an Elevator to include some of the horse/human fact cards from the "Horse Book in a Bucket" program plus some writing tips for children (the novel also includes recipes from Grandma's kitchen). I can present the "Horse Book in a Bucket" program myself, but I do focus more on my novel and the process of writing. If there are any horse enthusiasts wishing to present the program or have me present it, please contact me directly at: saundersbooks@aol.com. I am looking for low/no cost ways that children can learn more about horses so I can make recommendations to their teachers about how the children can find out more from "real" horse people (ones that might be able to bring in a bridle, saddle, etc.). The following reduced images are samples of information cards, worksheets and teacher’s answer keys from Cornell University’s “Horse Book in a Bucket” program—a bucket that includes educational materials for children, such as the novel, Ride a Horse Not an Elevator, toy horse, mane comb, breeds poster, containers of oats, corn, and soy bean meal, and a horse coloring poster. 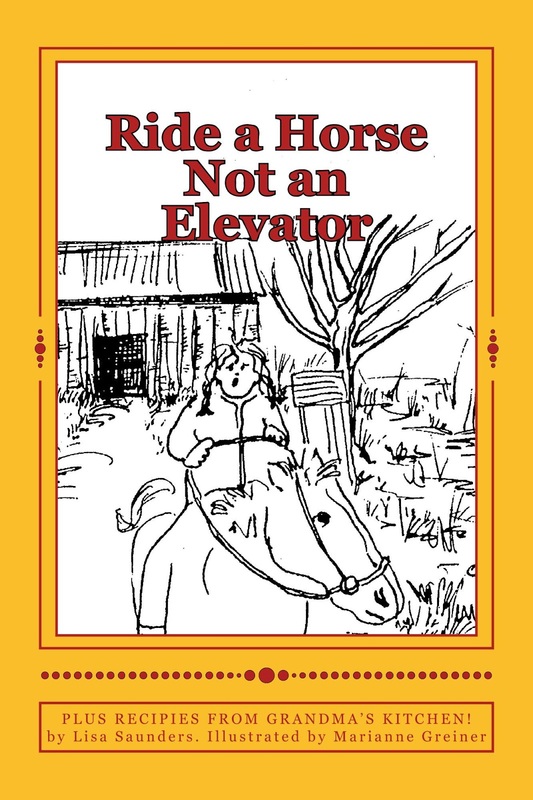 “Ride a Horse Not an Elevator is a refreshing tale of a young city girl lucky enough to still have grandparents living on a farm. Using the horse as a magnet, we have tied Lisa’s story of life’s lessons in this child-friendly setting to agriculture, the care of horses and horse nutrition, to human nutrition and good eating habits, fitness and exercise,” said Jeannie Griffiths, Cornell Cooperative Extension Horse Specialist, Department of Animal Science, Cornell University. The Horse Book in a Bucket” program, targeted at youth in the first through third grades, was created at Cornell University by the Department of Animal Science. There were many collaborators in this project, including the Department of Nutritional Sciences at Cornell University, industry leaders, financial sponsors and more. For more information about the “Horse Book in a Bucket” program, contact Jean T. Griffiths, Extension Horse Specialist, Department of Animal Science, Cornell University, at: jtg4@cornell.edu, 607-255-2857. Lisa Saunders is the author of the novel, Ride a Horse, Not an Elevator. Does that mean she wrote the story or does it mean she drew the illustrations for the story? Although Ride a Horse, Not an Elevator is based on true events and real people, Ms. Saunders calls it a novel. What is the definition of a novel? Stories usually have at least one problem and a solution. What were some of Lisa’s problems? How were these problems resolved and/or how did Lisa decide to think about things to feel better? Lisa was caught between two worlds—her grandparents’ farm in the country and her parents’ high-rise apartment in New York City. Where do you think she belonged? What are the definitions of “plot” and “theme”? What is the plot of Ride a Horse Not an Elevator? What is the theme of Ride a Horse Not an Elevator? What did Lisa’s mother ask Lisa to do before taking the long car ride with her uncle to upstate New York? Have you ever regretted not listening to your parents? Explain a time you wish you had listened to them. I have enjoyed writing stories ever since grade school—but sometimes my stories got me into trouble because I liked to write real and imagined stories about people I knew. Try to avoid writing about the people in your life unless you get their permission or you know they will be pleased by what you write! While attending Suffern High School in New York, I joined the school newspaper and wrote a humor column about real events at school. But when I ran out of things to say, I decided to major in Business Management and Marketing instead of writing at Cornell University. After my children were born, however, I had a lot to say again, so I started writing stories in form letters and sending them to my family and friends to tell them about some of the funny, scary, or sad things that were happening in my life. I later shaped those stories into articles and submitted them to magazines. The ideas for my children’s novel, Ride a Horse, Not an Elevator, came when my then first-grade daughter, Jackie, asked me what it was like to ride a horse and go to my grandparents’ farm every summer. I showed her photographs, which helped me remember what happened. I put those photographs into a photo album and wrote little anecdotes to go with each one. To help me remember even more about that time in my life, I called my parents, aunts and uncles, and my grandmother who was still alive. I even called a veterinarian to find out what my grandparents’ dog would have been like after his leg was amputated. You can start publishing your stories now. My daughter Jackie got her first short story published in a local newspaper when she was nine years old. She is now working as a professional writer in Washington, D.C., at a large, national organization. · What is the bravest thing you have ever done? · Were you ever injured? What happened? · Did someone ever save your life? What happened? · What was the scariest thing that ever happened to you? · What are some of funniest things that have happened to you? · Have you ever taken a long car ride? What did you do to keep it fun? · Do you have pets? Do they ever do anything that gets them in trouble? · Were you ever afraid of something? How did you overcome your fear? If you haven’t overcome it yet, what steps are you taking to deal with it? · Do you know how to do something like catch a fish, bake cookies, or sew a travel bag? Can you write down the directions so someone else can do it? The easiest way to get your thoughts into print and begin gathering "your" audience, is to submit letters to the editor (don't forget to include your hometown when you do) and to submit stories to those free weekly newspapers and monthly magazines you see lying around. They are short staffed and welcome free stories with a good photo or illustration (only send images that won't violate anyone's copyright). I finally began earning money as a freelance writer when I called a Rockland County, New York, magazine offering them a story I did on a friend in the area who beat the Guinness World Record time for paddling down the Mississippi River. The editor replied, "That sounds very interesting, but we have a limited budget and won't be able to pay you." I assured him that was fine. I just needed to get my foot in the door. Later, that magazine offered me the chance to write the feature story, "The 7 Wonders of Rockland," for which I was paid. When a developer read it, they contacted me with the offer to write even higher paid articles about the towns where they were building. Although the magazine and developer were paying me to write on a specific topic, I was still able to share my personal insights and "voice" within. It's almost pointless to send a query letter to an editor without addressing it directly to them. You can find an editor's name by flipping through the pages of the big general books such as, Children’s Writer’s & Illustrator’s Market; The Young Writers Guide to Getting Published by Kathy Henderson, the Writer's Market and Literary Market Place, which are probably available at your library or local bookstore. I've always found the updated contact information by sitting on the floor of bookstores and libraries and skimming through magazines looking for the current editors, or I call publishers to find out who the submissions editor is. Read children magazines such as "Skipping Stone," "Stone Soup" or "Cicada" to see what kinds of stories publishers are looking for. The next step is the query letter, which introduces you and your work to a publisher. I've had the most luck when I simply jump right into my story, hoping to catch their interest in the first sentence. For example, the following query letter landed me a publisher for my memoir, Anything But a Dog! It began: "Inevitably, most kids ask for a dog. And who can blame them? Dogs like Lassie adore you, keep you warm when you're caught in a blizzard and drag you out of burning buildings when you're unconscious. But by the time we're adults, we've learned the truth: dogs urinate on your new wall-to-wall carpets; dig holes in your leather recliners to hide their rawhide bones, and bite your neighbor's kid. So when my seven-year-old daughter Jackie asked for a dog, I said no. Our younger daughter Elizabeth was disabled and wouldn't be able to protect herself from a frisky animal. But I did make Jackie a promise: 'If God brings a dog to our doorstep, you can have it.' In the meantime, I offered her a hamster..."
Magazines and newspapers need images to make their pages come alive—and many have had to lay off their photographers. Offer to provide images with your story, and if that's not possible, suggest images they might want to consider. In my historical story, "The Hanging of Henry Gale," I wrote to the magazine: "After reading the article about the Revolutionary War in your June issue, I thought you'd be interested in my story, 'The Hanging of Henry Gale.' My ancestor Henry Gale was a captain in the war who later became a leader in Shays' Rebellion. He was found guilty of treason and sentenced to hang. I can submit a photo of his headstone and suggest an illustration of Shays' Rebellion from the New York Public Library image database." My first story accepted into a national magazine was a result of my sister-in-law meeting the editor at a party. My sister-in-law mentioned to the editor that I had written a short Christmas story about my disabled daughter. The editor was thrilled because she still needed a story for her December issue. When you write, write from your heart—share your soul. Don't write what everyone else is writing. When you share what you are really thinking, your readers may just find a kindred spirit in you. Try to write every day, such as letters to your family and friends, or in a journal. Lisa has written a free e-book, “How to Get Published.” She is also working on the soon-to-be released softcover book, The National Guide to Self-Publishing Books and E-Books (for free). Visit her website at www.authorlisasaunders to learn more. If you would like to have your story published in a book of short stories by other young writers, have your parent contact Lisa Saunders at saundersbooks@aol.com for more details.